Konchordat, first of three bands on the second day from the distinctive Bad Elephant Music label, blew away the cobwebs and woke up any bleary eyed punters after Friday’s excesses with an early set of their entertaining brand of progressive hard rock… with the emphasis very much on ROCK. Stuart Martin on lead guitar, vocals and occasional keyboards was an impassioned and talented front man. Neil Hayman on drums was particularly impressive in front of a growing crowd on Stage Two. HRH Prog on Day Three well and truly WOKEN UP! Tony: Refreshed after a very hearty breakfast consumed in Porthmadog (other breakfasts are available), first act of the day on Stage Two were Konchordat. They were brilliant. Yes, I know drummer Neil Hayman from The Gift (to be unwrapped later) but this was heavier, rockier, closer to but not quite metal, with subtleties and flair. Great set guys, loved it. I should have asked for the set list! Appreciated by the audience and more than blew away a few cobwebs, they deserved more than the couple of hundred that came to see them. See this band, disappointment will not be a menu item. 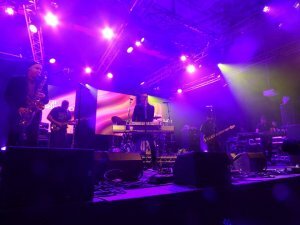 Leo: One of the joys of going to Rock Festivals is finding the ‘Surprise Package’, and this Greek Progressive band were DEFINITELY the ‘Jack-in-the-Box’ band for HRH Prog V as they played a magnificent set in the Main Arena to a crowd that grew and grew as word clearly spread that something special was happening. 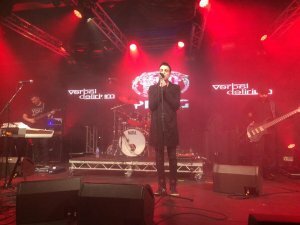 Led by the enigmatically named and charismatic Jargon, Verbal Delerium played the large venue with real showmanship and confidence ‘to the manor born’. 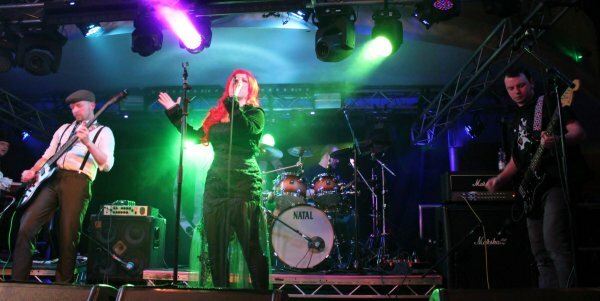 Playing songs largely drawn from their recent album The Imprisoned Words of Fear, Verbal Delerium beguiled the audience with their mixture of heavy progressive rock of complex and melodic epics through to more emotive and passionate shorter songs. Tony: I stayed for the beginning of Luna Kiss, good and I liked what I heard, you are on my ‘next time’ list, but my desire was Verbal Delirium. Last night’s midnight cloning failed, I remain one, and the Greeks are on the march. So they say, beware Greeks bearing gifts, well this was a present that I was more than happy to receive. I had listened to their recent album many times, my expectations were high and they delivered. A balanced nuanced set, and I can only say without a set list and familiarity that I really am looking forward to the next time (Midsummer Madness, 16th July in Balham). For a band not that well known in the U.K. they gave a commanding performance, and deservedly received the ovation accorded at the end of their set. Leo: The veteran Sheffield based Proggers, played an entertaining set. Their set was divided between newer material of a more folkie nature with violin and flutes, and later their vintage material ‘from previous Millennium’ as they described it. They were also full of humour and this show made some middle aged people very happy, remembering their youth (NOT a criticism! 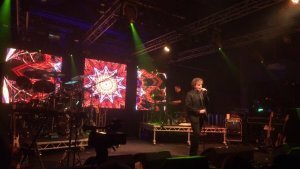 )… alas I only saw some of their show as I moved from stage two to the main arena to see the popular Progressive rock act of Karnataka, in an effort to understand their appeal. …BUT (you KNEW there would be a ‘BUT’ coming) I just don’t know what it is about Karnataka. They are clearly very talented and impressive performers but their music doesn’t connect with me. Despite apparently having all the right ingredients the result does not bake into a musical cake of my liking… sorry. HOWEVER, based on the numbers in the Main Arena and the acclaim that their performance generates MANY would disagree with that as they were definitely enthusiastically received! I have seen them before and had similar feelings, but just like the last time having decided they are just not my ‘cuppa’ they launched into their climactic epic Secrets of Angels, a marvellous showcase for Griffiths’ powerful voice and a piece displaying the great musicianship of the whole band. This is a clearly an impressive number upon which to close their set, and I am left scratching my head as to my stubborn innate agnosticism about this band. Let’s be clear and fair, they are obviously a very good band with much to recommend them to many people, but I am left largely unmoved… you can’t win ’em all ! 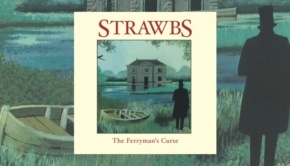 Leo: Fearing a ‘Folk Fifth Column’ TPA investigated The Strawbs, who were thankfully devoid of any Unions at this gig. 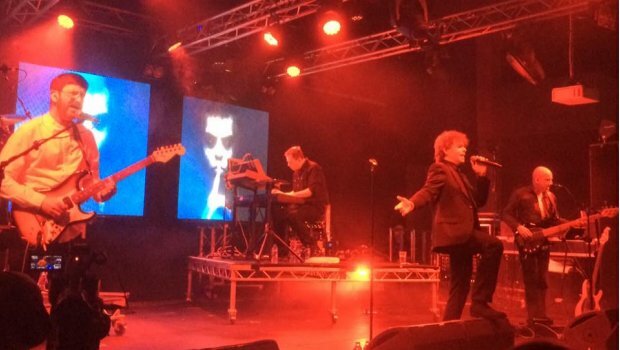 Dave Cousins’ distinctive voice cuts through the auditorium and they shrewdly lean more towards the Progressive Rock aspect of their past when Cousins announces they are playing the whole of their 1974 album Hero and Heroine (“with a 21st Century twist”). He reminds the audience that this classic album was voted in the Prog Magazine Top 100 Prog albums of all time. It’s a fine album and shows they know their audience with a high quality set of rock, which many in the crowd love. 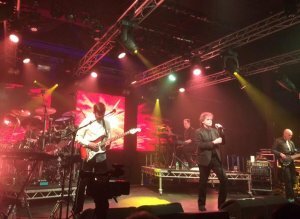 Cousins signs off humorously saying “See You again… in another 30 years!” This is a veteran band that can still produce the goods musically, and it would be hardly surprising if he keeps his word, such is their durability! 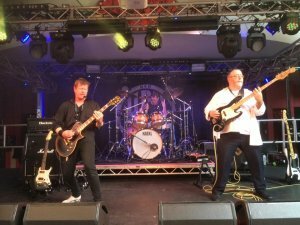 Tony: My game play was more or less set for Saturday: The Strawbs, Wishbone Ash, The Gift and Gandalf’s Fist, and any moments I could steal with the wonderful IQ, seen last Summer’s End. 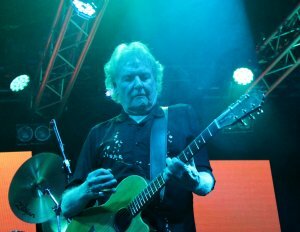 The Strawbs provided us with an excellent afternoon fair following on from the younger and more sprightly Karnataka, Hayley’s presence and style leading the band, and her seemingly operatically trained voice working well with the audience of at least 1,500. 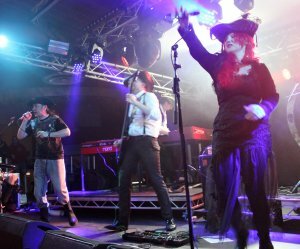 Two great acts, very different, but representative of the eclectic mix that the HRH team have put together. Again I find the sound on the Main Stage not as pin drop sharp as Stage Two. I suspect the soundcheck is to an empty room, and the addition of soft furnishings in the form of a couple of thousand punters completely changes the dynamics. That said, there are sound hotspots, there are areas dedicated for the disabled, the VIP’s are nicely kept out of the way and access to the pit is easy. Much credit should be given to the site security who were professional and charming. Leo: Stage Two surrenders to the overwhelming Progressive assault of The Gift, who released one of the best Progressive Rock albums of last year in Why the Sea is Salt. They play a remarkably assured set feeding off a good crowd, which grew as their set progressed and attracted more and more curious punters. Opening with the dramatic Sweeper of Dreams, with hints of the Sensational Alex Harvey Band, has an immediate impact, and shows this is a band that has really stepped up the quality of live performance and presentation, right down to their rather dapper and colour co-ordinated appearance. 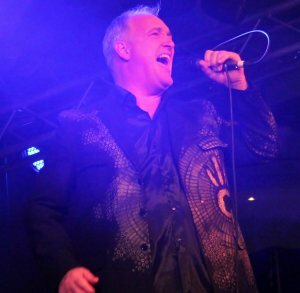 Mike Morton leads with charm, and a fine singing voice, comfortable with more rock oriented or softer, more sensitive material. Neil Hayman, making his second appearance of the afternoon as he also plays with Konchordat, provides a solid but sensitive base to their sound on drums. Stef Dickers’ understated bass underpins the whole set, but he comes to the fore with some agile work on the largely instrumental At Sea. ‘Professor’ David Lloyd expresses himself beautifully on guitar, particularly on the bravely chosen and more pastoral Ondine’s Song. 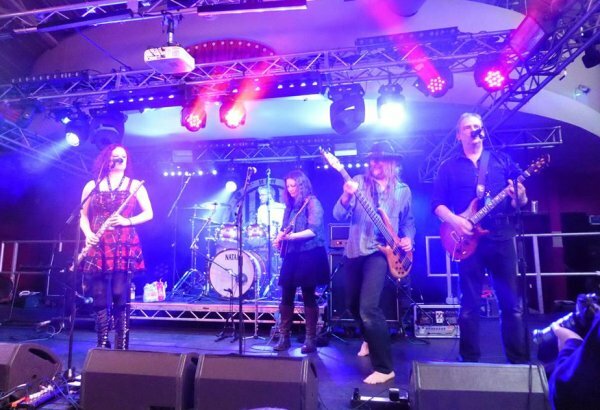 The touching mini epic The Willows, from 2014’s Land of Shadows album, is definitely their best ever song and it is doubtful that a finer Progressive Rock song is played by any band at HRH Prog over the weekend – it’s that good! Tuesday’s Child features the mercurial keyboard talent of Gabriele Baldocci, who clearly LOVED coming out centre stage with his ‘Keytar’ to solo with brio and add some real spice to this lovely song. Baldocci is clearly a great new attribute to The Gift, and is instrumental in upping their game on to a whole new level of skill and showmanship. 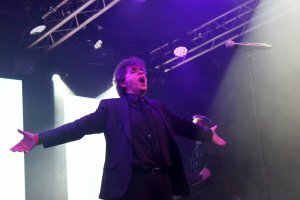 The Gift also specialise in expression of emotion and achieve the remarkable feat of quietening down a rather ‘chatty’ festival crowd with a sensitively played stripped down version of The Tallest Tree, featuring Baldocci and Morton. Morton emotionally introduces it as a song, written after the loss of his father, about the “Mystery of Love being greater than the Mystery of Death”. The album version features the stellar talents of Peter Jones (Tiger Moth Tales) on penny whistle with Steve Hackett and Anthony Phillips of Genesis fame contributing electric and 12-string guitar – but this live version compares favourably to the guest star original version… and even gains applause from the usually implacable stage crew! 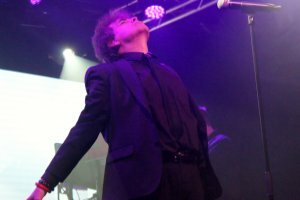 Politics and drama imbue their closing epic, extracted from their first album Awake and Dreaming, which is transformed with venom and power in a live setting as Morton fantasises about the day they called War and no-one came… if only. The Gift put on one of the gigs of the weekend, and it is to be hoped that if they return to this event that they perform in the Main Arena, as the quality and dramatic impact of their music would resonate powerfully within a much larger auditorium in front of the larger crowds they truly deserve. Tony: Missing Atomic Rooster (which I’ll probably regret) I waddled back over to Stage Two for The Gift followed by Gandalf’s Fist; two very different bands, who were both graced with an audience of about 500. David Lloyd of The Gift felt it may have been their biggest audience to date, and from the moment of the first note to the fading of the last, The Gift, despite lacking the presence of Leroy “Shoes” James, were superb. Mike Morton works an audience well, with banter, anecdotes, a small degree of insanity, plenty of pathos, it all pulls together. Sleeves were worn, music was played, and the contributions of each band member was perfect – David, Gabriele, Stef and Neil (second appearance after opening with Konchordat), take a bow. From the Prog.com merchandise stall, the word was that The Gift shifted the most CDs of any band of the weekend. In a world in which the selling of merch is often the difference between survivil and oblivion, this is good news. Perhaps something for HRH VI – better merching facilities for the bands, both big and small? 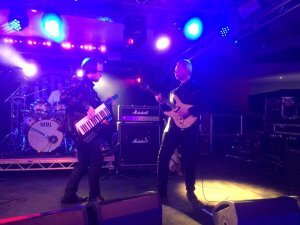 Tony: Gandalf’s Fist had hinted at something akin to Spinal Tap; it didn’t quite go that far but again they delivered, even with a five minute skip to IQ who were being awesome, I wanted to return to the fun of GF. Loved it, fun energy, and could not help but smile. I even managed to get the set list…but where is it? Filed during the recent Kitchen upheaval. Three great vocalist, great musicians, wonderful songs, completely barking, great drummer not your typical (???) German. A really entertaining performance, seek them out later in the year at their Fistival in August, a one day event in Cumbria. 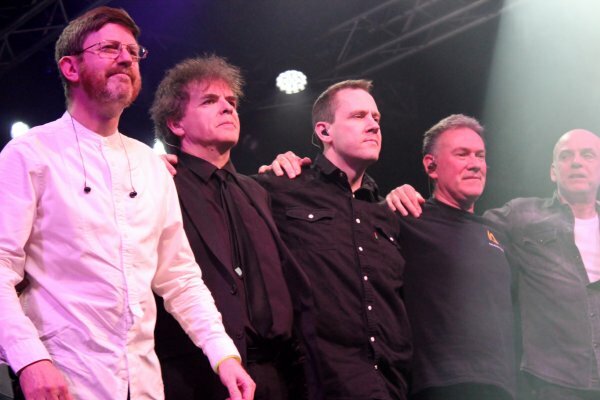 Leo: There are many Prog bands… and then there is IQ! 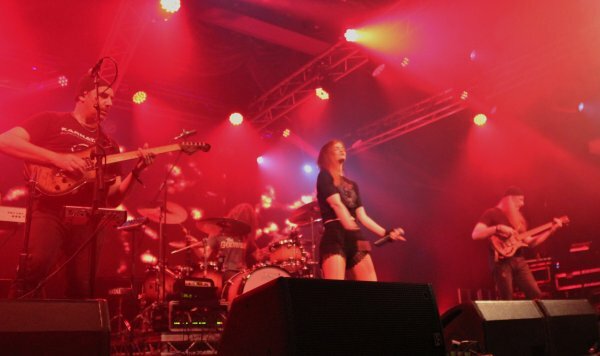 They give a masterclass of Progressive Rock, songs full of drama and passion presented in a visual and musical feast. The fantastic imagery and sounds are well suited to the large auditorium and packed crowd in the Main Arena. Peter Nicholls fronts with a mixture of dramatic intensity, pure emotion and occasional humour. 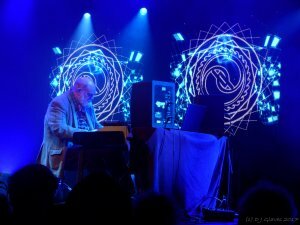 Neil Durrant weaves walls of gothic keyboard majesty and delicate traceries of sound. ‘Cookie’ drums with his usual power and touch, perfectly carrying along their complex and changeable pieces with aplomb, combined with the deft feel and groove of Tim Esau on bass. Effectively leading this fine Progressive rock band, who just seem able to produce album after album of great quality long into their career (please note other veteran Prog bands of more eminent reputations! ), is the guitar maestro, Mike Holmes, displaying his usual skills and eccentric charm. Breathtaker from Subterranea is a stunning and rocking opener, ripe for an increasingly ‘refreshed’ festival crowd. Every song is a class act, and the four songs from their most recent album, The Road of Bones sits comfortably alongside more classic material, particularly the menace of the title track and the vampiric horror of From the Outside in. One surprise is the welcome inclusion of Constellations, from the ‘bonus’ disc of their last album, presented live with peculiar Monty Python-esque imagery. Their back projected images are eye catching and interesting for their whole set – complimenting the music but not distracting from the drama implicit in the songs. Guiding Light from The Seventh House album features a moving vocal and keyboard intro before developing into a marvellous guitar show case for Holmes, but never loses sight of it’s emotional core, which is the secret of IQ. A pounding version of Failsafe takes us right back to Subterranea, and the set is completed by Headlong, a truly great song dating back to their 1985 album The Wake. 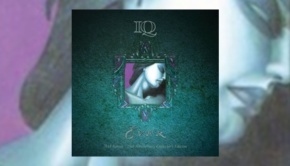 IQ demonstrated again why they have been and continue to be one of the pre-eminent Progressive Rock bands of the last 30 years. 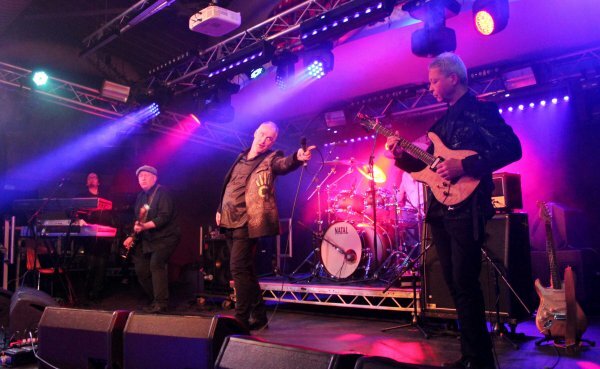 Whilst others have fallen by the wayside or have lost their drive or artistic ‘Mojo’, IQ have remarkably maintained their integrity and quality, and continue to produce fantastic shows and wonderful albums. Tony: I caught the end of IQ, again excellent, sorry I missed the rest but a balance over other desires – must perfect that cloning! 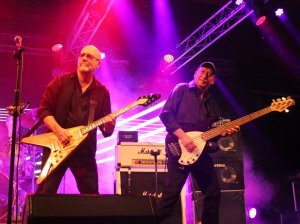 Leo: After the Prog grandeur of IQ it seems curious to schedule the more classic rock of Wishbone Ash, but it is evident that they have attracted many fans who delight in their hard rocking ’70s ‘Flying V Guitar Rock’ style of music. The large crowd greatly enjoy a set largely based on their renowned early albums, such as Argus from 1972. Solo after solo is skillfully peeled off the guitars over thunderous bass and drums as a high class rock band blasts through classic material with confidence born of years of gigging. Eschewing much in the way of fancy lights and visual imagery this is a band who are confident that the mastery of their instruments is sufficient entertainment for the punters. This indeed seems the case as the crowd go bonkers as the set progresses. Phoenix is a scintillating climax of dexterous soloing and draws the main event to a spectacular close. Tony: Things didn’t wind down, after Stage Two closed Andy Powell’s Wishbone Ash beckoned on the Main Stage. Nostalgic? Yes, but storming and I loved it, made up for the times as a Teignmouth schoolboy that I didn’t get to see them. Others may try, but soundwise (in both incarnations!! ), there is only one Ash. A great set. 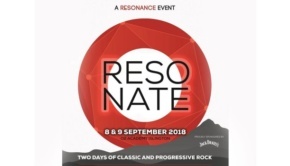 Leo: There is one last coda to the whole event as The Enid were scheduled to play out the festival late into the night, but it appears that booking may have been made before the recent upheavals in the band. However, ‘the show must go on’. Strangely, things could have been construed as a case of ‘And then there was One’ as the trio of The Enid that appeared on Thursday night were apparently now reduced to one sole member. However, it was actually founder member of The Enid Robert John Godfrey playing ‘piano improvisations’ on a stage lit up like some sort of Liberace version of Heaven. It is to be hoped that he had not actually sacked the other three members over the weekend! In the tired and emotional state that the TPA representatives were left in after three solid days of gigs, one could have been forgiven that with this final vision of an old man with a white beard bathed in light and playing ethereal music could have indicated that we were starting to hallucinate a strange sort of ‘Prog After life’! Alas it was all too late and too much and we wended our ways to much needed beds. Tony: The finale, was due to be The Enid, various rumours had been circulating, and the stage was eventually graced by Robert John Godfrey performing his classical compositions. I feel that he did not get the reception that he deserved as people drifted away to socialise, become comatose or prepare for the journey home on Sunday. I stayed for a bit, and it was interesting, possibly even better than that, but after the energy of Wishbone Ash, perhaps in the wrong place. 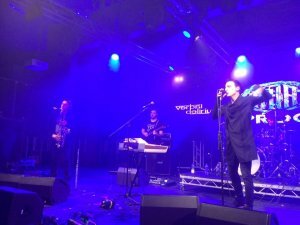 Leo: This was a much expanded and well organised event, encompassing a wide range of bands. Large numbers attended, probably the largest some of these bands had ever played for. Some festival goers were uncomfortable with the crowds in the Main Arena which was quite packed with some rather competitive action for seats at times! However, there was plenty on Stage Two to entertain. Debates about whether the bands were ‘Prog’ or not could be had, but frankly that would be pointless. One has to acknowledge that HRH Prog provided a setting and line-up that attracted large numbers of gig goers, who came for a variety of reasons and bands – what is healthy is that those attracted to bigger ‘name’ bands and heritage classic rock acts will also have been exposed to some lesser known but high class rock and prog acts… and that has to be a good thing. Maybe… I just wish they could move the venue (albeit in a beautiful part of the world) a bit closer to the rest of the planet! Tony: So overall, HRH Prog is a well organised event, giving a showcase to old and new and worthy of your pennies. Glad not to see a burger for few days, or chips! Probably needed more time between sets and overlaps, and there definitely needs to be access to free wi-fi, but it was great. Sorry to the bands that I did not get a chance to see; Dream Circuit, Haze, Heights, etc., all of whom I received great feedback about. Glad not to be sleeping on a foot and half wide plank. Will absolutely do it again. 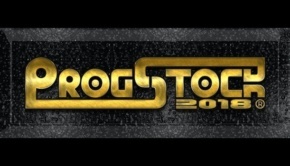 HRH Prog VI will be in November this year, the same mix of old and “new”. If a chance occurs, please give one or two of the smaller bands time on the Main Stage. Be as organised and as welcoming as you were this time – I know you will. You can read the report from Day One of HRH Prog V HERE and Day Two HERE. All photos by Leo Trimming, Tony Colvill and Dave Glaves, used with thanks.